If you’re planning on sitting down and watching TRUTH OR DARE with a glass of wine, it’s recommended to leave the wine bottle and opener in the kitchen. Probably ideal to also have a vomit bag in one hand just in case and a stress ball in the other to squeeze as hard as you can when necessary….which will happen often throughout the film. The internet sensation group Truth or Dare Devils consists of Jennifer (Jessica Cameron), Michelle (Heather Dorff), Ray (Shelby Stehlin), Courtney (Devanny Pinn), Tony (Brandon Van Vliet) and John (Jesse Wilson). They film themselves playing truth or dare and performing shocking dares to entertain their cult of online viewers. When the film opens the tone is set as an intense nail biter when the dare is a form of Russian roulette. Jennifer has the gun and Tony is the target and he loses. Next scene they appear as guests on a TV show and the public is curious if Tony was shot and killed. Tony struts onto stage exposing that the deadly dare of Russian roulette was staged. Amongst the audience is superfan Derik (Ryan Kiser), who wants to join the group and is overly obsessed about it. Derik’s psychotic actions and aggression gets him escorted off the stage and out of the building. The group knows their online fans may diminish due to the staged dare, so they have to ramp things up. They take the show to a house in a remote area and start off by playing the actual rules of Russian roulette. The outcome doesn’t go as planned and they’re panicking trying to figure out what happened and what to do. That’s when psycho fan Derik shows up uninvited and brings his own set of truth or dare rules and ensures that there won’t be any lies or fake dares for this segment. From that moment on it’s pure brutality with gut-wrenching moments. Derik being deranged as he is, knows everything about all the Dare Devils including their darkest secrets which are darker than you can imagine. The psychological and physical game Derik plays with them has each character in a whirlwind of emotions and they don’t know what the hell to do when it’s their turn in the game. Gaining notoriety fuels Derik’s psychotic behavior as he keeps checking how many views and comments the video has received. The more views the more he gets excited and makes the dares more revolting. With an abundance of shocking torture moments, there is some humor inserted as an attempt to reset the audience’s mind. Some may miss the comedy due to the last dare looping in their mind. The characters are put into extreme decision making situations that impacts them mentally and physically. Seeing what the friends are doing to each other is difficult to grasp, however considering what they have gone through and the pain they will endure if they don’t carry out the dare, their mindset is do whatever it takes to survive. To play the role of these characters the actresses and actors can’t just scream in their scenes, they needed to get into a very bad place in their own minds in order to carry out their roles. Not an easy nor pleasant task for actors and each one of the cast members did a stupendous job especially Ryan Kiser as Derik who was handing out the dares and weapons. The movie has a lot of blood and effects to shock the audience, but it also lets the audience use their imagination. In various scenes, they are cut at the perfect moment or the actors facial expressions and sound effects have the audience visualizing the worst in their minds. To sum up the film in one word is intensegraphicbrutalitynastyviciousstomachchurner that will be imbedded in your mind for several nights. 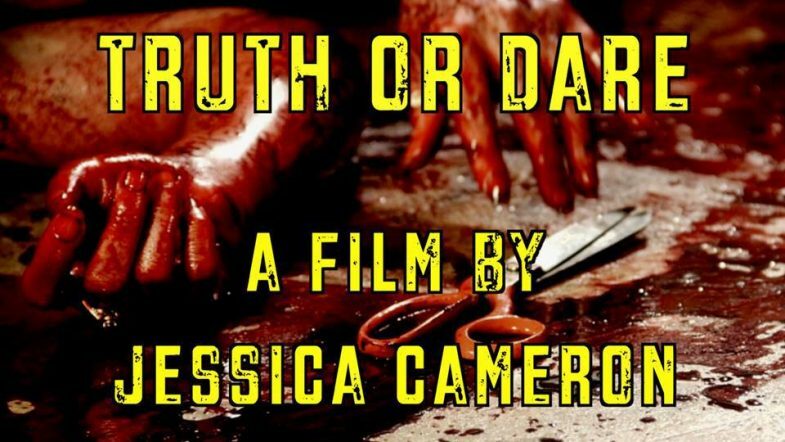 So, if you like horror, gore and movies that contain usage of household items as torture devices, then check out TRUTH OR DARE.